Trinidad Express profiles Cecil Lee, National Chess Star!! Shammi Kowlessar, "At 61, Cecil Lee still looking for...Checkmate," The Trinidad Express, 18 October 2002 (Port of Spain, Trinidad). Trinidad Express wrote a very interesting article about NM Cecil Lee, a long-time Caribbean chess maven. The chess master from Trinidad and Tobago has enjoyed an illustrious career for the Trinidadian side having represented his country around the world in many international tournaments. The intriguing article discusses Lee's humble beginnings and how he was drawn to chess after trying cricket and draughts. Lee seemed to be another product of the "Fischer era," who's high-profile match with GM Boris Spassky did a lot to draw interest in every quarter of the world. After many failed attempts at winning the National crown, Lee finally won the heralded title in 1978 and repeated this feat in 1984 and 1987. At 61, Lee has seen his share of chess battle and also competed in the 1984 U.S. Open in Forth Worth, Texas. Lee will captain the Trinidadian team at this year's Chess Olympiad in Slovenia and will lead the contingent of Ryan Harper, Mario Merritt, Ravishan Singh and former national champs, Christo Cave, Yogendranath Ramsingh and John Raphael. 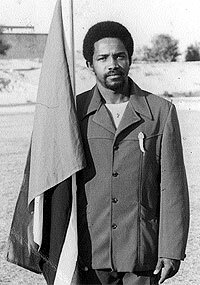 Cecil Lee posing with the Trinidadian flag at the 1976 Olympiad in Libya. Photo courtesy of T&T Chess Federation. "At 61, Cecil Lee still looking for...Checkmate"